Winchmore finished with one fewer goal — and one fewer player — against a bolstered 15-man St Albans side. Both teams got opportunities in the opening exchanges. Goalkeeper Balazs Endrodi and the defensive line of Mike Dutnall, Harry Franks and Eray Osman worked hard, but it was St Albans that made the most of their fresh legs to lead 1-0 at half-time. After the break, Osman was upended in the centre-circle and landed heavily enough to break his collarbone in 3 places! Following this, Winchmore suffered a mini-collapse as they struggled to reform themselves with only 10 on the pitch. This soon resulted in a 4-1 lead for St Albans, with Winchmore’s goal courtesy of a Tim Mall reverse stick strike from a tight angle after dancing through the opposition’s defence. But Winchmore weren’t done. 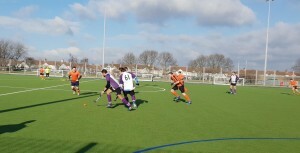 An attacking line of John Adam Elliott Lappin, Jake Sumner, Tim Mall and Leo kept up the intensity; Dominic Smith and Matt Dray doing their best to break down the play in the centre of the pitch. Eventually, Mike Dutnall’s crisp strike from a short corner was crowned with a guttural roar and a shimmy and shake from man of the match Dom Smith brought it to 4-3. Another 10 minutes and Winchmore may well have pulled level despite their numerical disadvantage. Or, the tiredness may well have seen them ship another four; we’ll never know. Best wishes to Eray — who has been a very handy and dependable defender for Winchmore this season — and we hope to see him back in action soon. Match postponed due to frozen pitch / snow in Potters Bar.